Pretty Pooches Points Of View! : Another surprise foster dog! Today we had another little dog come to us as an emergency foster case. 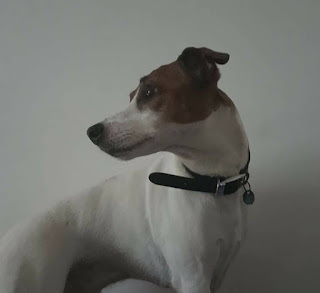 This sweet little long legged Jack Russell Terrier is called Mutley. He is about 9 years old and the poor baby was found alone with his human dad, who had sadly passed on suddenly. 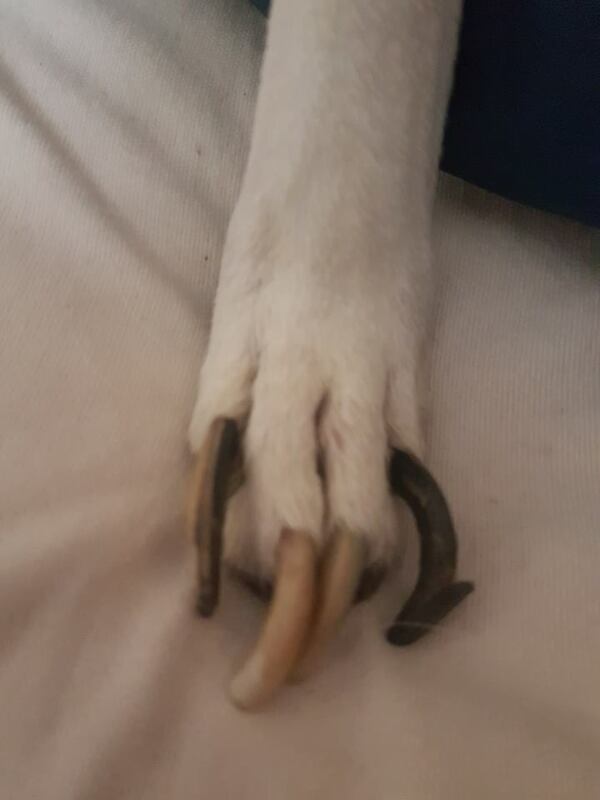 His body is in fairly good condition however his nails were extremely overgrown to the point of his toes being damaged from the length of them and for how long he must have had them like this. This photo doesn't show off how bad they actually are, his nails were snapping, breaking, and generally in poor condition, along with being extremely overgrown. This would take years to get to this point and shows he hasn't been walked properly in a very long time either. They have of course been clipped now and he is already much more comfortable. We hope there wont be any long lasting effects from this. His teeth are in awful condition. Not only do they have an extreme build-up of tarter, but he also has such inflamed gums that the slightest touch makes them bleed. This would be extremely painful for him too. This little dog has been suffering for a long while sadly. He was clearly well loved but didn't have the all care he needed. 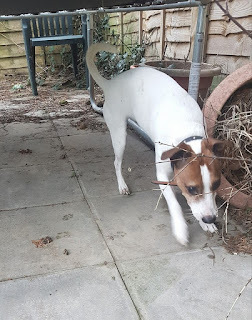 We have been told he has an esophagus (throat) problem that means he can only eat mushed up food, but he has managed a couple of tiny bites of chicken without any sign of a problem, so maybe the issue is not as bad as we were told. His vet check will tell us more details. 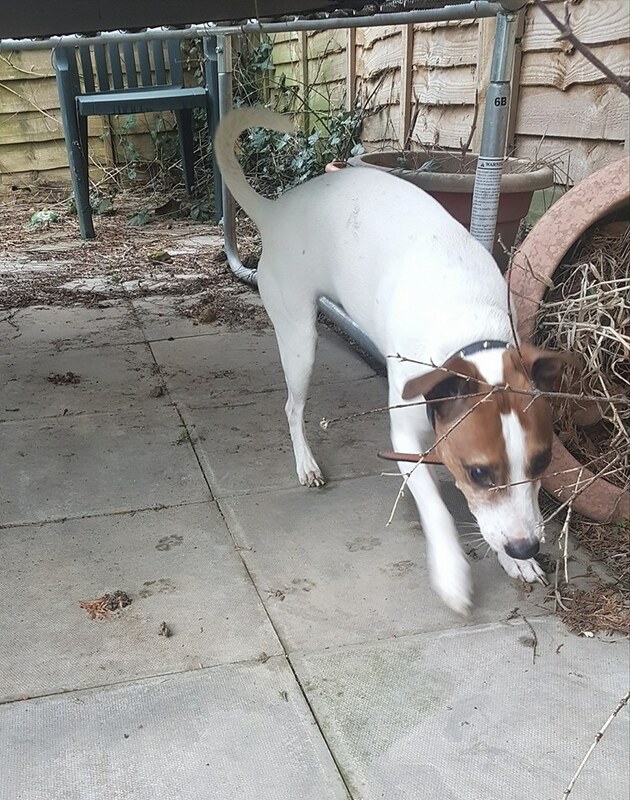 Mutley will be booked in to have a dental, neutering, and if needed, any other veterinary care he requires. Once this has been done and he has had a proper assessment, he will be available for adoption through the rescue.